Detectives investigating the suspected murder of a sailor who disappeared in Gibraltar are to appeal on television to a person with vital information. 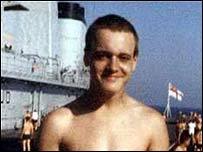 Simon Parkes was 18 when he disappeared after a shore trip from the aircraft carrier HMS Illustrious in 1986. The South Gloucestershire radio operator's body has never been found. Hampshire police will appeal to a person who contacted the BBC after watching BBC Two's July documentary, Body Hunt: The Search for Simon Parkes. Det Insp John Ashworth, who has been leading the investigation, said: "I would strongly urge this person to contact us. "I have always been convinced that someone out there knows what happened to Simon. "This inquiry has been running for a long time now, and his family need to have answers to their questions. "For his family's sake, I would appeal to the person who called the BBC in July, to please get in touch." Mr Parkes went missing after a night out with his colleagues. Officers from the Royal Gibraltar Police have been involved in a joint investigation with Hampshire Constabulary into his disappearance since 2000. The appeal will be made on Crimewatch at 2100 BST on BBC One.